Rumors say the upcoming version of Rock Band will feature a keytar-like instrument. (Ars Technica) -- Information about a keyboard being included in the "Rock Band 3" package was teased in the "Green Day: Rock Band" demo. We have now been given some exclusive information by our now-famous Mole about what we can expect from "Rock Band 3." Read on to find out what to expect from the instruments in the latest version of the game. There won't actually be a keyboard peripheral sold with the game; instead there will be a keytar-like instrument supported. For those who didn't listen to much '80s music, a keytar is a sort of keyboard with a strap, held like a guitar. 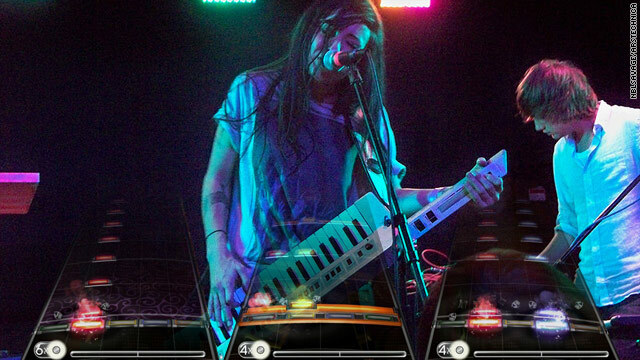 The keytar will be the only new instrument for the game. We were surprised that new instruments were being released at all, since Activision had noted that they were focusing on software and not hardware in order to cut costs. We figured Harmonix would follow what seemed to be a savvy strategy in a world already choked with peripherals. Harmonix will actually be doing something similar, and the peripherals will be created by an outside company. Mad Catz will be creating all the "Rock Band 3" instruments and bundles; EA will only be distributing the software. Mad Catz will be offering many different bundles with different combinations of instruments available, and there will be bundles that are exclusive to certain retailers. If you have guitars, you'll be able to find a bundle for drums. If you need everything, that will be available as well. If a store doesn't want to be saddled with huge boxes, they can simply stock the game. This will allow the focus of the launch to be kept on the software, and we're told that there will be a "pro" mode included in the game that will require proper technique, and may lead to actual skills on guitars and bass. How this will work isn't known, but it's possible Mad Catz may create a product that more closely mimics an actual guitar. All this information is firmly in the rumor pile, excluding the Mad Catz connection, but our Mole has successfully broken more stories in gaming news and peripherals than anyone else in this business, so we're confident in this data. It also makes sense: Mad Catz has long had the license to release Rock Band peripherals, and large bundles suffer from thin margins and can be expensive to stock. Giving control of the hardware to a company who knows how to release and ship peripherals makes sense for everyone, and more bundles give retailers a new layer of granularity to stock items based on their needs. As for the keytar? We have no clue. Expect this information to be confirmed at E3.